The truly online component of atrafanaSchool is in place. atrafanaStudies is a biweekly course delivery system that provides the students with flamenco guitar study material once every two weeks within the span of one year. You will receive the first lesson immediately following your enrolment. Then you will get the next one in 2 weeks, and so and so forth. The material will be delivered to you via- email. 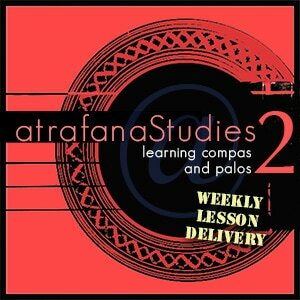 atrafanaStudies delivers the lessons in an order that makes educational sense. It is mainly based on years of teaching and pedagogical experience, if I may say so :-) Therefore, it is not just the incremental reveal of stuff but the order in which they are revealed that is important here. This is the closest you can get to taking one-on-one private lessons from atrafanaSchool. atrafanaStudies is particularly suited to flamenco guitar lovers who do not have either the time or the means to take private lessons. The system works as a subscription that takes quite a low monthly fee for the duration of one year. Follow the link and check out the price to see what I mean! The lessons you will receive via atrafanaStudies are EXCLUSIVE for its syllabus. In other words they are DIFFERENT than all the other study resources displayed at the STORE. If you have already downloaded material from the store, including the FLAMENCO GUITAR METHOD, you can still enrol in the atrafanaStudies programme. The lessons will be new. After each lesson, you will have 2 weeks to practise the material at your own convenience and in your own time. The lessons are designed as falsetas that focus on particular techniques. I urge you to make videos of your own practice and save them into folders that you keep the study material. This way, you can keep track of your progress. atrafanaStudies is mainly a technical course that does not delve into the ins and outs of palos such as solea, buleria etc. Each lesson takes a palo as its basis for sure but palo learning is addressed under the Compas Mastery section of the STORE. atrafanaStudies aims to give you a solid basis in flamenco guitar technique within one year. The Compas Mastery Packages available at the STORE are still more advanced than the material covered in atrafanaStudies 2. As with the previous instalment, atrafanaStudies 2 comes with falsetas NOT available in any other study package available at the STORE. Each falseta/exercise comes with both tef and pdf sheet music (notes and tabs) as well as a slow split-screen instructional video with compas counter. You can put the falsetas and remates into sequences that make up full pieces.